In the March 2017 issue of Wood News, Jeff Fleisher changes up his normal review process and does a comparison review of two of our most popular selling calipers, the 6 inch Fractional Dial Caliper and the 6 inch Fractional Digital Caliper. 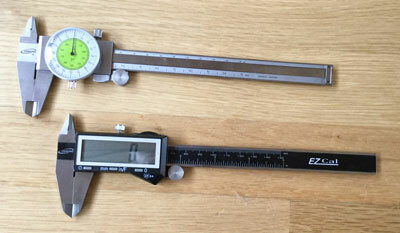 This will not be a typical review of each tool but rather a listing of the pros and cons to help you make an informed decision when purchasing one, or both, of the calipers. Tips from Sticks in the Mud – March 2017 – Tip #2 – Twist Ties Which Festool Track Saw is Right for You?